Medieval monster scholarship tends to be dour. Monsters, it says, embody anxiety. They imply what we are by showing us what we believe we’re not. And if monster scholarship is fun, it tends to be fun because it believes itself to be dallying in the forbidden. This is the fun of breaking the law, breaking the law, which means it’s not getting rid of anxiety but rather playing anxiety’s flip slid, and dancing to it, ecstatically. “Resistance to social constraints”! “Unthinkable Dangers”! Some examples, not exactly up to date, but recent treatments for the most part say much the same: just search for medieval monsters anxiety on Google Books. But only special pleading, I think, could turn the Wild Man and the Mermaid of that Creation scene into a scene of worry. It doesn’t respond so well to the language of, say, 50s B-Horror movie posters (“thrill to the…!” “can you escape from the…!” &c). defining the borders of the thinkable? grotesque incarnations of the incognizable formlessness of the Real? the crawling chaos of our own selves, imputed to the abject other? figures of the East itself, the site of Eden, and a call to colonize it and to tame or enjoy its bounty? the uncategorizable not-All that remains when the whole field of life collapses into the binary, hierarchical categories of human and animal? I think the mermaid and wild man are fun. Maybe just fun. Maybe mostly just fun. Of course we can do more: we can follow the history of other illustrations like these in whatever direction in culture or time, so we can have more fun looking at them. And of course we can continue to write about monsters, even these ones, as materialized forms of various cultural anxieties. That kind of work has been done well by people I’m happy to have as friends, and it’s been done by me too: I’m addressing this, I suppose, to mes semblables, mes frères. 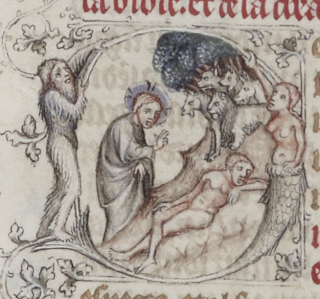 Certain medieval monsters really are primarily about the dominant culture’s anxiety over the impossibility of ever coming up with a working definition of being Christian, male, human, whatever. And of course it’s worth it to do scholarship that afflicts the powerful and comforts the afflicted, so long as that’s what’s actually being done. At least, it’s no small benefit that scholarship that goes after the rich, misogyny, racism, gender anxiety, and so on, has increased our fun by giving us more texts to read and teach, material that often works with our students better than the usual set of Great Masters. With all that in mind, I’d also strongly recommend not forgetting the monsters children draw. Speaking as someone who was once a child, I’m sure kids draw monsters mostly because monsters are fun to draw. Unhappy children draw them because they’re unhappy, too, but not all children are unhappy, and even unhappy children aren’t unhappy all the time. I’d recommend trying to write about monsters, or whatever, like children draw them. I don’t know how that would work, not yet. I’m definitely not sure how to do non-serious scholarship about fun, especially since so much scholarship is so concerned with being rigorous (an awful, awful word), but I’d invite anyone who’s doing scholarship to try. If we need justification, maybe it’s this: believing in the world-political importance of what we’re doing as humanities scholars is a good way to believe that we’ve done all we need to do once we’ve done our scholarly work. It’s a good way to delude ourselves into a good conscience. If we remember that what we’re doing as scholars is mostly fun, maybe we’ll be more inclined to be serious about the things so many of us purport to care about. 1. An easy way to know if something is actually dangerous to the “sickeningly conventional and thoroughly corporatized” whatever: is ALEC passing laws against it? Can you go to jail for it? Will your career, if you have one, be ruined? Will liberals tsk-tsk you? This entry was posted in MedievalBlog and tagged art, monsters by medievalkarl. Bookmark the permalink.